All you fans of Heroes of the Storm have further cause to celebrate the game's (albeit limited) co-op mode. 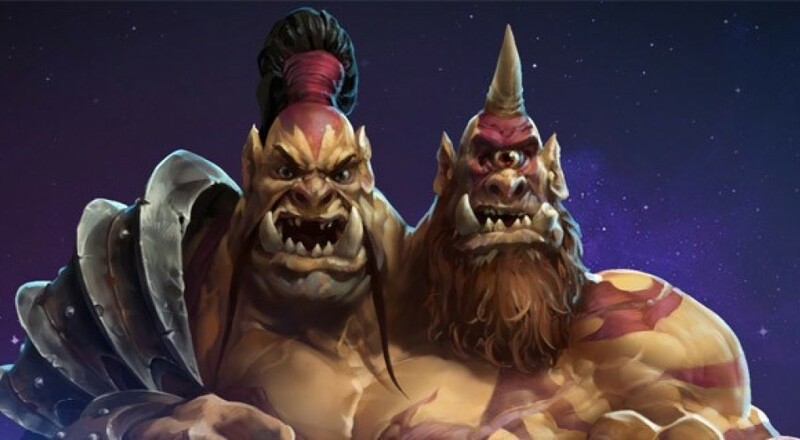 A new hero - the ogre mage Cho-Gall - has been added to the roster from the depths of the Warcraft franchise and he offers a unique twist; two players must control him and work together to utilize all of his abilities. Fans of the original RTS Warcraft games on the PC may recall that the two-headed ogres on the Horde side could be upgraded to ogre magi that utilized battle magic to buff allies or create traps for foes. Among these units, Cho'Gall was debuted as a sort of hero unit that has gone on to be featured in the World of Warcraft universe. He now makes his way to Heroes of the Storm and brings with him a new way for controlling heroes. One player will control the "Cho" head, which is largely melee focused and actually moves the ogre around the map, while another player controls the "Gall" head, which utilizes magic. Interestingly, the only way to unlock this hero (for now) is by playing as one of the heads with someone that already has him unlocked and winning two matches. Doing so permanently unlocks him in your roster. The Heroes of the Storm General chat has been pretty good with people who already have the hero offering the opportunity to unlock to those folks who don't. This behavior is actually being encouraged by Blizzard as winning four matches with Cho'Gall while playing with someone who doesn't have the hero unlocked will net you a cool 2,200 in-game gold; enough to buy another character. All of this falls underneath the "Buddy Brawl" event that's currently being run and ends on January 1, 2016.